When Florida State quarterback Jameis Winston said after last year’s Rose Bowl that the blowout game could have gone either way, it was laughable. When Georgia State’s players and head coach talked after today’s game about having an opportunity in the second half to make a comeback against the Ducks, it was hard to deny. Though undone by four turnovers, the Panthers moved the ball against Oregon with enough regularity to be competitive. Take the fumble by quarterback Nick Arbuckle late in the third quarter that Joe Walker returned for a 54-yard touchdown, which turned out to be a key moment. “You can’t turn the ball over the way we turned it over,” agreed head coach Trent Miles. 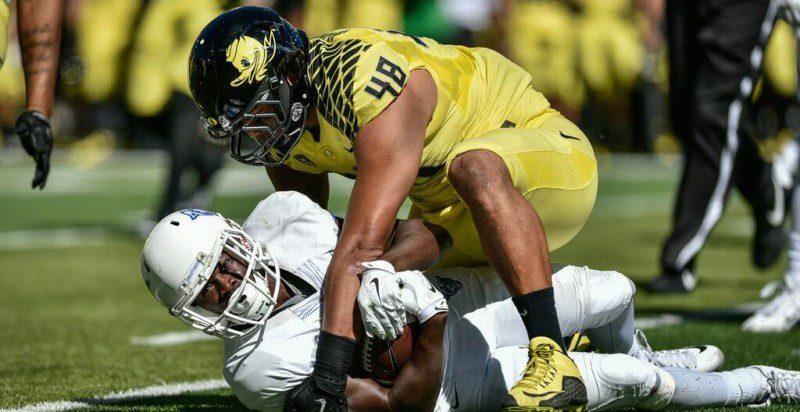 Indeed, the Panthers put up 431 yards (to Oregon’s 539) and accrued 22 first downs, just seven short of the Ducks. 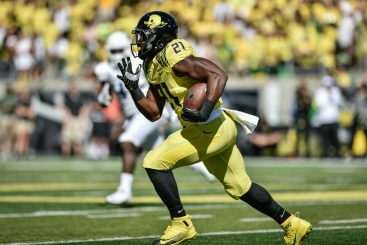 Robinson’s big day helped the Ducks outlast Georgia State. Turnovers were the story from the first Georgia State drive of the game, which ended in a Tyree Robinson 41-yard interception return for a touchdown. “It’s not the best-case scenario,” Miles said. “You start yourself in a hole. It’s tough enough when you’re playing on the road in a hostile environment against a team that played for the national championship. Georgia State entered the game with a high level of confidence, particularly after seeing the way another pass-oriented team, Eastern Washington, was able to score on the Ducks. “Every hour we spent in the film room we got more excited, me and the receivers and the tight ends, because we saw how our game plan was going to work and that we were going to come out and make plays,” Arbuckle said of Georgia State’s pregame preparations, which helped give the quarterback a lot of open receivers to throw to. Arbuckle’s gutsy performance wasn’t enough for the Panthers. “We expected a lot of man coverage and situations where receivers had to get open,” Arbuckle added. “Our receivers learned to run routes like Eastern Washington did, because we saw how much success they had being able to get open. “I give much of the credit to our receivers being able to emulate that stuff: the same kind of releases, the same kinds of head fakes on the top of the routes, to be able to create separation and get open. Coach Miles also took pride in how despite the 61 points given up to the Ducks, the Panthers had their moments. 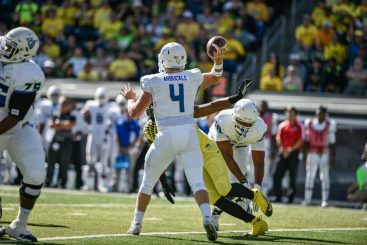 In particular, Oregon’s core offensive strength — getting speedy players in open space — was countered by Georgia State defenders who tackled well and prevented many explosion plays. Royce Freeman led a dominant Ducks ground attack. 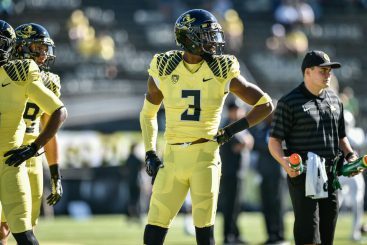 When asked if there was anything that surprised them about the Ducks, either in terms of the X and O strategy or the Autzen environment, Miles said no. Although Georgia State was making its first trip to Eugene, Miles, whose coaching career dates to the late 1980s, had been here as an assistant with Fresno State, Stanford and Washington (tasting victory with the Cardinal), and praised the Autzen Stadium environment. Even so, the Panthers hold their heads high as they make the long flight back to Georgia.